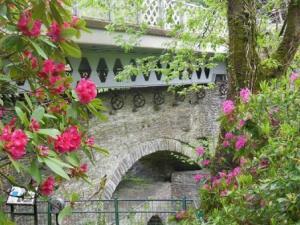 Devil's Bridge Waterfalls & Nature Trail01970 890233work Waterfall or GorgeTake a walk along the Nature trail and see the spectacular 300ft waterfalls and the view of the 3 bridges, built one on top of the other, which span the breathtaking woodland gorge. Follow in the footsteps of the monks of past, along the path and descend Jacobs Ladder (100 steps). Cross the humped bridge spanning over the Mynach river at the bottom of the waterfalls and begin to ascend the other side of the gorge. Go into Robbers Cave, an old hideout place next to the waterfall. Incorporated along the walk is a free viewing telescope, decking and gazebo with seating. Information boards with local history, u-turn boxes with the legend and history of Devil's Bridge and clips of traditional Welsh harp music. Alternatively, you can choose the easier, short walk to view the 3 bridges and the Devil's Punchbowl. Discover the Legend, of how an old lady and her dog outwitted the Devil. Take a walk along the Nature trail and see the spectacular 300ft waterfalls and the view of the 3 bridges, built one on top of the other, which span the breathtaking woodland gorge. Follow in the footsteps of the monks of past, along the path and descend Jacobs Ladder (100 steps). Cross the humped bridge spanning over the Mynach river at the bottom of the waterfalls and begin to ascend the other side of the gorge. Go into Robbers Cave, an old hideout place next to the waterfall.